Equipment Sales: Standard and Customized Lab & Commercial Scale Units: Ethanol Extraction, Solvent Recovery, Short Path Wiped Film Distillation. Wiped Film / Rolled Film (RFL) and Short Path (KDL) Distillation system designed for Laboratory distillation applications are available with a wide ranging list of features and options which can significantly affect the operating capabilities of the unit. In this brochure, a number of the basic systems configurations and potential options will be reviewed. 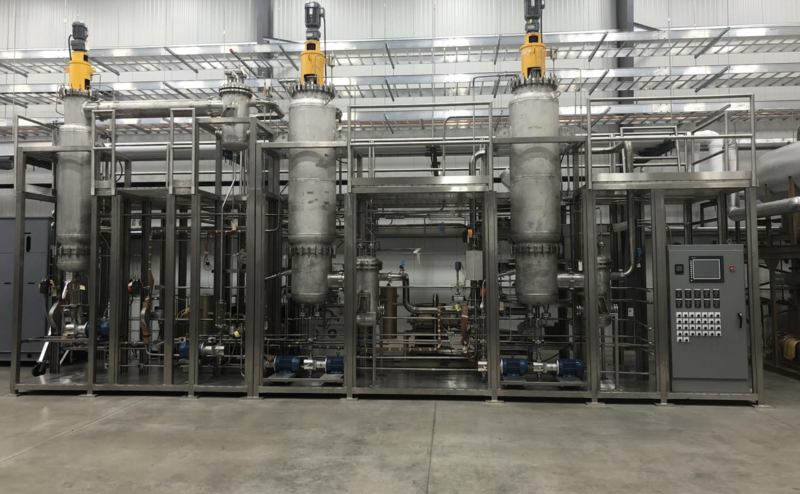 However, our experience with Short Path Distillation Division has been most RFL or KDL Systems sold in recent years have been customized to some extent based on the end user’s specific distillation requirements. Some of the basic elements and potential for customization are discussed below. The primary and most important component used in any Wiped Film or Short Path Distillation system is the actual evaporator (sometimes referred to as the distillator). As indicated previously, laboratory systems typically utilize evaporators ranging in size from 0.010 m2 to 0.100 m2. Other vessels configured in a system, such as: feed tank, receivers and cold traps, are sized based on the customer requirements. The sizing of these vessels is usually dependent on feed sample quantity requirement and duration of distillation run. For example, collection vessel sizes are as small as 0.50 liter and as large as 5.0 liters are common in laboratory units. The “Basic System” for RFL or KDL Distillation equipment (for countertop applications) utilizes ring stands for support with the ancillary equipment (vacuum pumps and circulators) positioned strategically on the lab countertop to support the operation of the Evaporator. Many customers prefer more positive support ranging from a small stainless steel cart to larger welded frames which may support a single evaporator or multiple evaporators (staged in series) and the required ancillary equipment including circulators. Welded frames normally utilize two (2) alternative materials of construction: (1) Welded Unistrut (carbon steel) coated with two- component epoxy in a color of choice; or (2) 304 Stainless Steel Square-tube (uncoated). Both frame styles have an integrated drip-pan for spill control and special features such as exhaust hoods are available as options. Frame mounted systems also include castors and levelers for convenient movement and leveling where multiple laboratory locations may be desirable. Heating and Cooling Circulators are used to maintain the temperature in the critical zones associated with this system. Generally, we consider five independent zones as requiring temperature control: (1) Feed System; (2) Evaporator Heating Jacket; (3) Evaporator Residue Jacket; (4) Condensing Vessel or Coil; and (5) the Cold Trap. The ability to control the evaporating temperature and the condensing temperature suggests the circulators which service these zones are the most critical (re: zones 2 and 4 in the illustration). The necessity to use circulators for the feed and residue portions of the evaporator is a function of the viscosity of the material being distilled. Generally, when the viscosity of the materials (feed, distillate or residue) exceeds 1000 cps, circulators are recommended. Circulators range in operating characteristics and selecting the correct circula- tion is based upon available voltage (e.g., 240 VAC @ 60Hz), power requirements related to heating and cooling (e.g., 2.5 kW heating with 800 Watts cooling), and control interface (e.g., simple PID for local control, or PID with RS232 interface for remote control). Typically, zones 1 – 3 described above are services with “heating only circulators” while zone 4 would normally be a “heating & cooling circulator: and zone 5 a “cooling only circulator.” Most heating circulators have a maximum temperature of 300°C which typically accommodates 80% of the distillation applications, but if temperatures above 300°C are required, a high temperature circulator with a sealed oil reservoir is available, which can reach 350°C with a 6kW heating capacity. If a circulator is used to service a closed loop Cold Trap (as an alternative to a cryogenic cold trap using dry ice or liquid nitrogen) the maximum temperature requirement is typically -40°C, although dual stage chillers are available which reach temperatures as low as -90°C. As suggested in the preceding sections, a functional distillation system includes many elements which require electrical power to operate. Summarizing, power will be required to operate: (a) Evaporator wiper system; (b) temperature control circulators: (c) vacuum pumps; (d) product feed or discharge pumps (if applicable); and (e) instrumentation (e.g., vacuum sensors, data loggers, PLC, etc.). Simple bench top systems can be assembled on a laboratory bench with a simple power strip providing electrical utility for all the components. However, in the case of frame mounted systems which typically utilize a multitude of electrical components it is more common practice to supply an electrical panel mounted on the frame for power and instrument signal distribution to the electrical components. The size of the electrical panel is typically influenced by the complexity of the distillation system (how many electrical components), control instrumentation requirements, and customer site prerequisites (e.g., NEC code and specific customer requests). Therefore, a laboratory distillation system which includes an electrical control panel may have an enclosure which ranges in size from a 12” by 12” panel to a full size 36” by 72” electrical & instrumentation enclosure. In addition to considering the electrical enclosure and power distribution requirements, consideration should be given to the level of instrumentation and control required for the application under consideration. In the case of benchtop systems, all switches and controllers (primarily PID’s integrated into temperature circulators) are local to the ancillary component (such as wiper system motor, PID controller on hot oil or glycol circulators). In more complex frame mounted systems instrumentation and controls are located in the electrical enclosure. Basic controls might include panel mounted power switched for ancillary components and digital displays for temperature and vacuum readings. More sophisticated instrumentation and control would include Data Logging devices or PLC controls to allow unattended operation of the distillation system. Data Logging devices facilitate accurate record keeping which can be downloaded using a USB port and thumb drive, while PLC systems include the Data Logging function but also control the distillation based upon parameters programmed by the operator (e.g., AEBP requirement). The disadvantage of the more sophisticated Data Logging or PLC system is the higher price requirement as electronic interfaces are added to the hardware package.